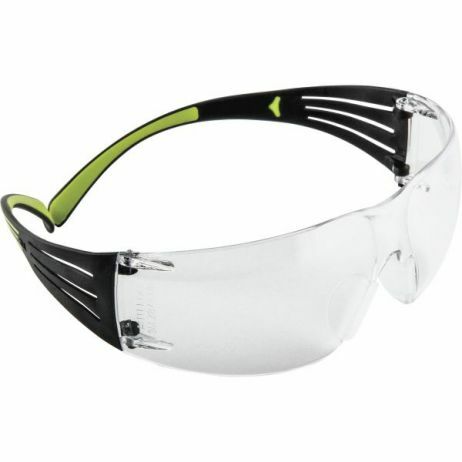 3M SecureFit, 400-Series, Protective Eyewear, SF401AF, Clear Anti-fog Lens, 20ea/cs - SecureFit protective eyewear features pressure diffusion technology that naturally adjusts to individual head sizes for a custom, natural fit as soon as you put them on. The self-adjusting design adapts to each wearer and provides a snug fit that keeps the glasses securely in place as the wearer looks up and down or side-to-side to eliminate the need for frequent repositioning. Removable, foam-lined gasket helps keep debris out of your eyes while providing comfort and cushioning. Dual-injected, padded temple touchpoints enhance comfort over your ears. Universal construction eliminates the expense of stocking multiple frame sizes at job sites to accommodate different people to keep your costs to a minimum. Impact-resistant polycarbonate lenses absorb 99.9 percent UVA and UVB rays to maintain healthy vision when used outdoors. Anti-fogging properties help maintain visibility in hot and humid environments to help increase usage on the job.